The Government’s response to a report calling for protection for UK farmers from cheap, lower standard food imports post-Brexit has been described as ‘disappointingly thin’ by the NPA. In July, the House of Lords EU Energy and Environment Sub-Committee published a helpful report on the implications of Brexit for animal welfare. 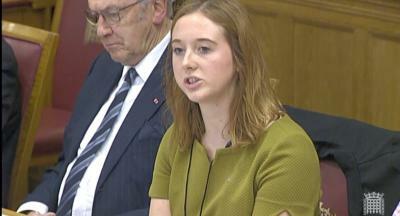 Having taken evidence from various industry and animal welfare representatives, including the NPA’s Georgina Crayford (pictured, right), the committee concluded that the greatest threat to farm animal welfare standards post-Brexit would come from cheap, imported food produced to lower standards than the UK. Unless consumers are willing to pay more, UK farmers could become uncompetitive and welfare standards in the UK could come under pressure, the report warned. In its response, published this week, the Government agreed that we should seek to avoid high UK animal welfare standards potentially being undermined by lower standard imports but gave little indication about its views on how this could be achieved. “There are a number of possible measures which could be adopted, including trade policy measures and this issue is under active consideration,” it said. There was a little more substance in the Government’s response to the committee’s concerns over whether animal welfare can be used as a rationale to restrict imports from other countries under WTO rules. Elsewhere, the Government made it clear it intends to retain our existing high standards of animal welfare once we have left the EU, with the EU (Withdrawal) Bill converting the existing body of EU animal welfare law into UK law. It also agreed that the repatriation of farm animal welfare policy presents opportunities to ‘review and improve farm animal welfare standards and practices’, citing plans to make CCTV compulsory in abattoirs and to modernise statutory animal welfare codes as examples. “The House of Lords report encapsulated all the concerns of the NPA and the wider UK livestock industry about the very real threat to the industry and consumers posed by lower standard imports. “The Government’s response is disappointingly thin, paying lip service only to the concerns raised and offering very little in detail as to what it can do to address them. The commitment to build on provisions relating to animal welfare in existing trade agreements is welcome but more clarity is needed. "We have a precedent – anyone connected to this industry will recall how the UK pig sector suffered when nothing was done to stop lower standard pork imports from the EU after we banned sow stalls in the late-1990s, while the rest of Europe carried on using them. This had a massive impact on domestic competitiveness and, ultimately, our production capacity.